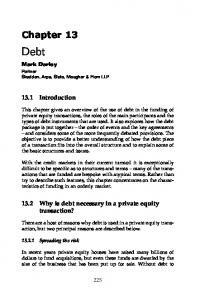 13.2 Why is debt necessary in a private equity transaction? What is private market debt? The Private Securities Litigation Reform Act and Particularity: Why Are Some Courts in an Alternate Universe? Why is the BEST choice! ive leading asset class professionals are gathered together at the Shard in London. As they survey the sweeping views of the city that the 95-storey skyscraper affords on this clear morning, it’s a grand setting for a bold question: what is the future of private debt? Of course, it’s not a question that has a simple answer.There are many different opinions on the subject and numerous ways of pondering it.This is precisely why hosts Brown Brothers Harriman (BBH) and Private Debt Investor have set aside a decent chunk of time for a group of private debt experts to debate the subject. asset class’s future does not preclude the possibility that there are also some challenges facing it. As some of the participants point out, investors have to accept some illiquidity. The view is also expressed that fund structures in the asset class need to match the liquidity, maturity and credit risk profiles of investors and that this has not always been the case. AROUND THE TABLE Graeme Delaney-Smith joined Alcentra in September 2004 and is head of European Direct Lending and Mezzanine Investments. Prior to joining Alcentra, he was an investment director at Intermediate Capital Group where he marketed the firm’s capabilities to private equity firms and originated and invested in numerous European mezzanine financings. Floris Hovingh leads Deloitte’s Alternative Capital Solutions team and is founder of the Deloitte Alternative Lender Deal Tracker. He focuses on raising alternative capital for private company clients. Prior to joining Deloitte in 2008, he had over seven years’ banking experience with HBoS and NIBC in their respective leveraged finance teams in London. Sam Metland is head of Alternative Fund Servicing Product at Brown Brothers Harriman which includes banking, administration and technology services for private equity, syndicated and originated debt, real assets and hedge funds. Prior to joining BBH, he was in the product solutions team at JPMorgan Investor Services, focusing on developing bespoke solutions for complex alternatives funds. In 2005, he was part of the team that led a PE-backed management buyout to create Augentius Fund Administration, where he had responsibility for all business systems. Sanjay Mistry is a senior member of Mercer Private Markets, a specialist unit within Mercer’s investment business and has been leading MPM’s efforts in the area of private debt since 2009. Based in London, he is involved in investing in private debt and private equity on a primary, secondary and co-investment basis on behalf of MPM’s discretionary funds and delegated clients as well as advising across a full range of investment activities. Adam Wheeler is Barings’ head of European and Asia Pacific Private Finance investments and a member of the firm’s European and Asia Pacific investment committees. He is also a portfolio manager for a number of Barings’ funds and separate accounts in Europe and Asia Pacific, including Gateway Mezzanine Partners I and II, Barings’ Asia Pacific focused mezzanine funds. Currently, private debt is mainly the preserve of larger funds, perhaps suggesting a lack of maturity. A couple of the participants point out that smaller funds and thematic plays do exist but capital tends to gravitate to the larger players because, at this point in time, they are an easier sell for the consultants. “there’s the prize of differentiation for those that can do it”. and drumming up business,” says Hovingh. option. There is, therefore, a big task ahead for managers and consultants in helping to educate and raise awareness. to have some element of control when things go wrong. have more positions and hence more diversified risk. example, by pulling loans or changing management. moving into the space where the syndicated loan market used to dominate – but does so no longer. “There’s still scope to grow [more strategies],” he asserts. Certainly, there has been a trend towards fund managers adding more strings to their bows – and raising funds for each of these different approaches.With the LP base now increasingly sophisticated and able to identify strategic nuance more capably than they have in the past, this may well be a sensible way to proceed. REASONS TO BE OPTIMISTIC ABOUT PRIVATE DEBT REGULATION ENCOURAGES GROWTH Following the financial crisis, regulations such as those arising from Basel III and the Volcker Rule in the US have placed constraints on the banks’ lending activities. But with mid-market companies still needing finance to grow, alternative lenders are stepping into the gap. GROWING PIPELINE OF DEALS Deloitte’s Alternative Lender Deal Tracker report for the first quarter of 2016 found that the 46 lenders covered by the survey had completed 63 deals during the first quarter, representing an 8 percent year-onyear increase in dealflow. This is consistent with the sense that alternative lenders are increasingly on the radar of mid-market business owners. Although owners in some parts of Europe may still have a sceptical view of private debt, many feel that the sponsorless market has room to grow based on the relatively small proportion of sponsorless deals in Europe relative to the US. INCREASING INVESTOR ALLOCATIONS Investors are becoming increasingly educated about the asset class and are more comfortable in making allocations. According to a recent study from advisory firm Elian, 41 percent of institutional investors said they planned to increase their private debt allocations over the next 12 months. Furthermore, almost three-quarters of respondents said the returns generated from their private debt investments had “exceeded expectations”. EFFICIENT AND FLEXIBLE FINANCING The economic and political volatility of recent times, which has rocked other asset classes, appears to be making private debt look relatively attractive as a flexible form of financing. With many predicting a downturn in the UK economy at some point following the vote to exit the EU, consultancy firm bfinance argued in a recent report that it would be asset classes least tied to the effects of low GDP growth and less sensitive to changes in inflation, such as private debt, that would benefit in the long run. backing the company,” he recalls. “Every time they wanted to make a bolt-on, the process became quite protracted. We gave them a committed facility that they could draw down at will and it allowed them to proceed more smoothly.” As Metland observes, this ability for private debt to allow growth companies to fulfil their strategic plans is a positive message within a financial services industry that doesn’t always enjoy a particularly good press. “It’s about giving capital to entrepreneurs to do what they need to do,” as he succinctly puts it. This would suggest that, in the interests of strong economies buoyed by growth companies with a range of borrowing options, private debt deserves to have a bright future. With investors increasingly swayed by the message that it brings positive characteristics to their portfolios that are not available elsewhere, prospects of just such an outcome would seem to be good. n This article was originally published in the October edition of Private Debt Investor. Report "Why the private debt universe is expanding"